Welcome to our new Learning Science Blog Series! In today’s blog we will explore how Knowledge Segmentation, a research-backed proven strategy from Cognitive Science, enables ScootPad to reduce cognitive overload by creating bite-sized knowledge segments and allowing processing time between successive segments. This approach has been painstakingly implemented on ScootPad to transform how knowledge is processed, retained and recalled to enable deep, long-lasting learning. Meaningful learning requires that the learner engage in substantial cognitive processing during learning, but the learner’s capacity for cognitive processing is severely limited – hence the situation called cognitive overload. A simple example of this situation is when a student is presented with an entire standard to be mastered in a small window of time. Knowledge segmenting is a mechanism by which the information offered is broken down into bite-size segments. Learner is allowed to digest intellectually one segment before moving on to the next. With this approach, the learner has time and capacity to organize and integrate the information resulting in efficient knowledge construction. Mayer and Chandler (2001, Experiment 2) broke a narrated animation explaining lightning formation into 16 segments. Each segment contained one or two sentences of narration and approximately 8 to 10 sec of animation. Students who received the segmented presentation performed better on subsequent tests of problem-solving transfer than did students who received a continuous presentation. The effect size in this study was 1.36 – referred to as the segmentation effect. Each learning objective (i.e. Standard) is segmented into multiple bite-sized concepts which are interconnected and sequenced using the knowledge map (see picture below). Students practice these fine grained concepts in progression with processing time between successive concepts – leading to mastery of the learning objective as a whole more effectively. Here’s an example of the bite-sized fine grained concepts in Kindergarten Math. In the picture shown below, Kindergarten standards (K.CC.A.1, K.MD. A.1 etc.) 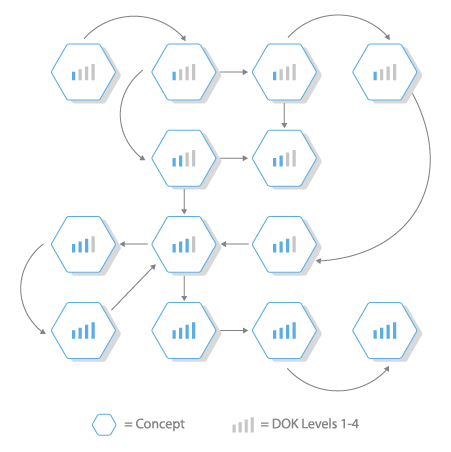 are segmented into several fine grained concepts which are interconnected and sequenced using the knowledge map. Then, these concepts are strategically organized and sequenced using a Learning Path which is made of multiple units each consisting of a collection of concepts. Notice that the concepts grouped in each unit (shown below) are interrelated but NOT unpacked from the same standard as in a blocked or massed approach. As the student progresses and proves proficiency in each concept, ScootPad will automatically present the subsequent concept to learn. Below, all concepts labeled “1” may be available in the first set of practice sessions. As the “1s” are mastered, the next concepts, labeled “2’s” within the same strand, are presented and so on. The student who successfully masters the concepts in a unit will move on to the successive units and be presented with more concepts which build from the previous unit. As shown below, once students start in this new unit, the learning continues. 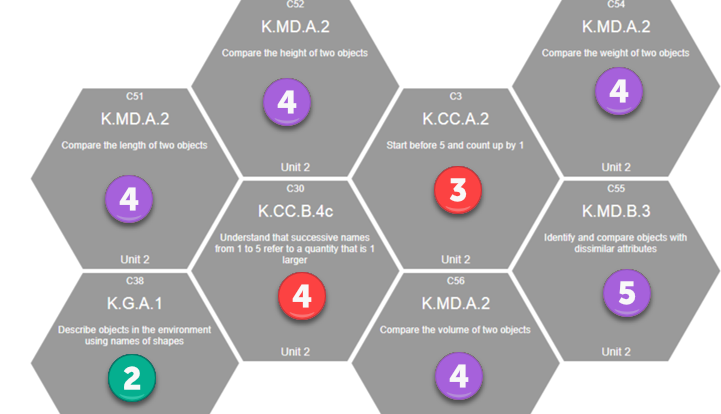 ScootPad uses Knowledge Segmentation to effectively reduce cognitive overload by segmenting each standard into bite-sized concepts and allowing processing time between successive concepts. With this approach, a student is allowed to digest intellectually one concept before moving on to the next. Furthermore, the student has time and capacity to organize and integrate the knowledge resulting in mastery of the standard as a whole more effectively. As a result, ScootPad is able to transform how knowledge is processed, retained and recalled to enable deep, long-lasting learning.